What are the Advantages of an Automatic Cat Litter Box? While everybody knows the more basic, plastic cat litter boxes it is the invention of the automatic cat litter box that exited pet owners everywhere. The self cleaning cat litter box frees you from frequently cleaning up after your cat and the unpleasant smell in your home caused by dirty cat litter. Thanks to the huge number of cat supplies stores on- and offline it is not all too difficult to find the right automatic cat litter box for your cat and you. Here are two more well-known companies and their noteworthy products. Littermaid is one of the most renowned companies offering automatic cat litter boxes. They already have satisfied customers in the millions and the number of users of their automatic litter boxes is growing daily. 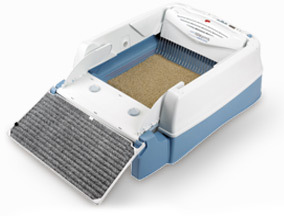 One of their products, the Elite Mega Automatic Self-Cleaning Litter Box is designed for larger cats or multiple cat households. Immediately after the cat leaves the box, triggered by a sensor and before the actual cleaning starts an ionic air cleaner eliminates bad odors. Then, after ten minutes a rake moves across the tray clearing any clumps and leaving it clean. Clumps are deposited into an autmatically opened and closed waste container. Depending on the model, the cat litter box comes with a number of waste receptacles, carbon filters, a paw cleaning ramp, triple action tool and cat privacy tent or LitterMaid Kitty Kabana®. Another recommended company is Scoop Free. 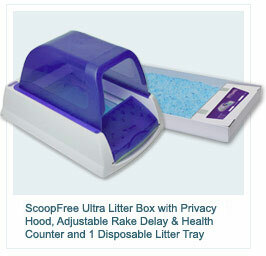 With Scoop Free’s new no-touch litterbox you don’t need to worry about anyting up to one month. 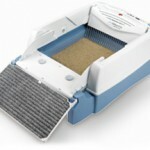 The litter box uses disposable trays, prefilled with FreshStep Crystals that last up to 30 days of use by an average cat. The FreshStep Crystals neutralize odor, absorb urine and dehydrates solids and a rake sweeps waste into a covered compartment, leaving litter smelling clean and fresh. After a few weeks simply replace the tray with a new one and throw the old away. Overall you save money and time, time that you can spend with your furry friend. These are just two examples of automatic cat litter boxes. What are you using? Please let us know what you have and what your experience with it is like.